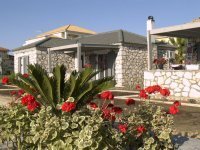 VILLAS AND APARTMENTS TO RENT ON THE IONIAN ISLANDS. Welcome to our selection of holiday homes to rent on the Ionian Islands, Greece. A trip to the Ionian Islands lives up to what a Greek holiday should be. Breathtakingly lovely beaches, history and archaeological exhibits take you to a place that seems out of this world. Ever tried Horse Trekking? If you haven�t, this is a good place to start. You can move through typical Greek countryside and villages on horseback and it�s a nice way to see the countryside up close. Once you are done with this, head to Paleokastritsa to enjoy the unbelievably blue waters along with the lovely bays and caves that dot the area. You can also hire a boat to explore the many islands. Snorkelling and rowboats are available to explore the caves. There is also a waterpark with plenty to do for adults and children. Move on to Porto Katsiki, which promises to be an amazing experience. The beach is out of this world and is definitely a must visit. It is not for nothing that it is considered one of the best beaches in Greece. From here, move on to St. George�s Castle. It provides a great lunch and dinner along with great views. Check out the Shipwreck Tour at Navagio beach that is sure to take your breath away. You can also see it from the air, which is equally spectacular! Eggremni beach has often been described as paradise because of the beautiful sand and deep blue waters. Every beach provides sun beds and umbrellas that can be hired if you just want to lounge about. If you enjoy visiting castles, you must see Sissi�s Palace. It is located on a hill and overlooks the bay and the sea. It is very well done up and the exhibits of 9 muses and that of the wounded Achilles are quite something. And the panoramic view from the top is truly amazing. Don�t miss the Archaeological Museum of Corfu that is quite well laid out with some good exhibits. The main exhibit is the gorgon Medusa sculpture. Also worth a visit is the Xygia Sulphur beach whose milky blue waters are said to have curative properties and is good for the skin. It is also a good place for snorkelling. Melisani cave is an underground cave that is well lit and where the sunlight hitting the water and mist is quite mesmerising and romantic! Looking for self catering holiday accommodation on the Ionian Islands? Then below is a selection of apartments on the Ionian Islands and villas on the Ionian Islands that can be rented direct from their owners. You can either click on each listing for further details or you can use our search engine on the left if you are looking for something in particular.